WHERE TO EAT: Paia Fish Market South (this was quite possibly one of our favorite meals on Maui- we came for lunch and had caesar salad with grilled mahi mahi, fish/chips… all so good– PLUS there is a cute little outdoor market right next door that is fun to walk through and browse for souvenirs), Monkeypod (note that during happy hour the apps and pizzas are 1/2 off– they have the best drinks and music on some nights), Spago (high end restaurant at the Four Seasons), Cafe O’ Lei (good, casual food), Pita Paradise, Da Kitchen, Fabiani’s, Coconut’s Fish Cafe (for the fish tacos), Kinaole Food Truck (best coconut shrimp), Nick’s Fish Market (at the Fairmont Kea Lani in Wailea), La Tienda Del Sol (for the fresh-catch ceviche), Sansei Seafood and Sushi (1/2 off on Mondays but VERY BUSY- be there by 4:20 pm to get in line. Recommended to get the ice cream/pound cake/fried dessert), Miso Phat Sushi (good food but slow service), Cuatro (I’ve been told that this place is excellent!! 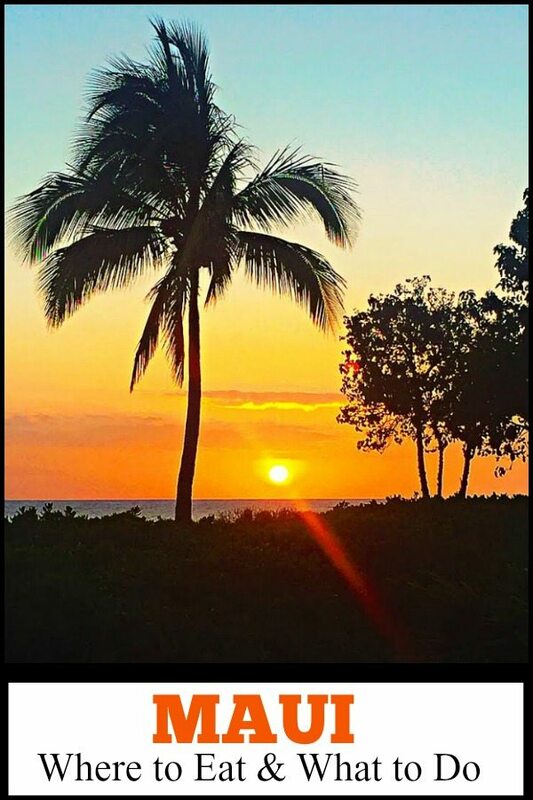 ), Sarento’s on the Beach (fine dining- beautiful open-air restaurant… perfect for sunsets), Maui Tacos (for a quick lunch), Cinnamon Roll Fair (for the most insane giant cinnamon rolls ever), Kihei Caffe (for breakfast). WHAT TO DO: If you want to see the fancy hotels, it’s fun to walk through the Grand Wailea and/or Four Seasons (next door to each other), The Shops at Wailea (for upscale shopping and the mainstream beach-brand stores), La Perrouse Bay (site of the last lava run on Maui – so you’ll see views of lava formations– also a good spot to swim with wild dolphins), Big Beach Makena (huge, beautiful beach), Cove Park (for beginning surfers), Wailea Beach or Polo Beach (both nice beaches), and Kalama Beach Park (good for surfing + park for the kids). 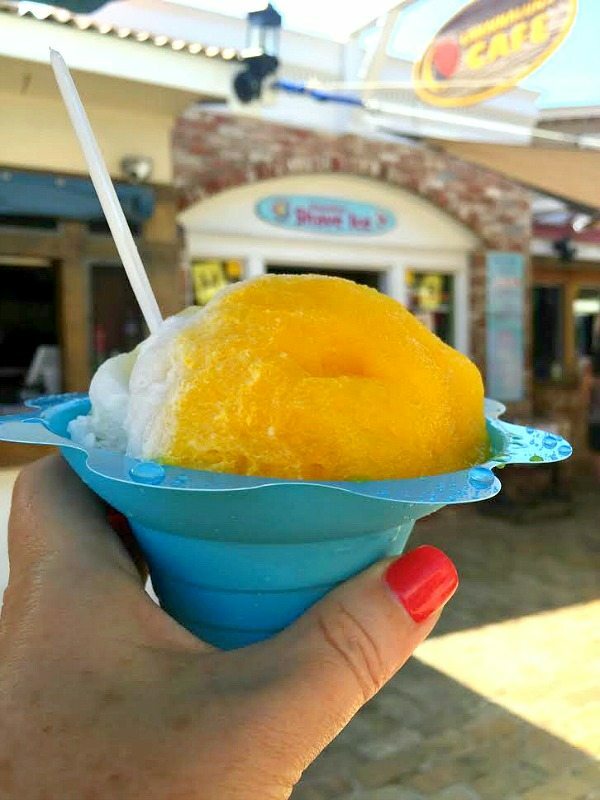 WHAT TO DO: Baldwin Beach Park (super cool to visit…huge waves, long gorgeous beach), Baby Beach, Ho’okipa Beach Park (best spot to see lots of sea turtles), The town of Paia– for lots of cute shopping. 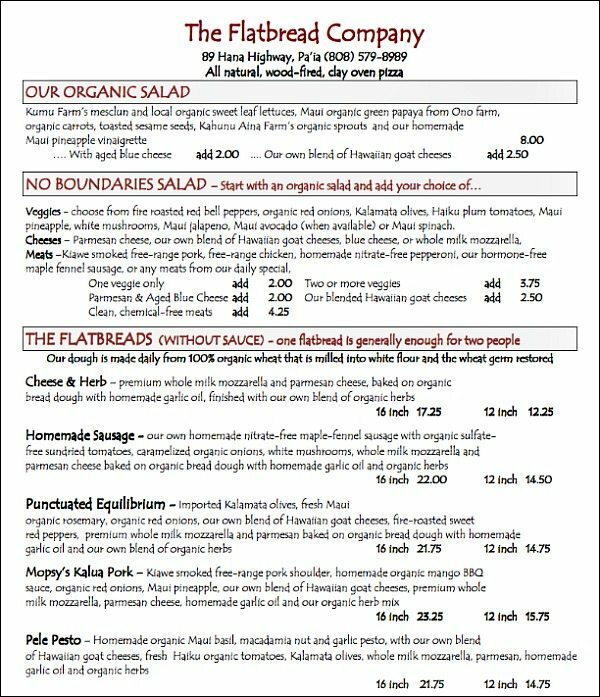 The Flatbread Company (not the complete menu): we didn’t eat here, but everyone we talked to had been here and LOVED IT. WHERE TO EAT: T Komoda Store and Bakery (for the donuts and malasadas) and Grandma’s Coffee House (far out, but a beautiful drive). WHERE TO EAT: Troy’s BBQ at Koki Beach Park (look for a small hut… and he’s only open one or two days/week- We were told to check grocery store fliers for his current hours. Food is great, so get there early as he sells out), also look for fresh fruit stands and banana bread stands. It’s probably best to bring some things to eat in case you’re not successful in finding an open spot to eat. 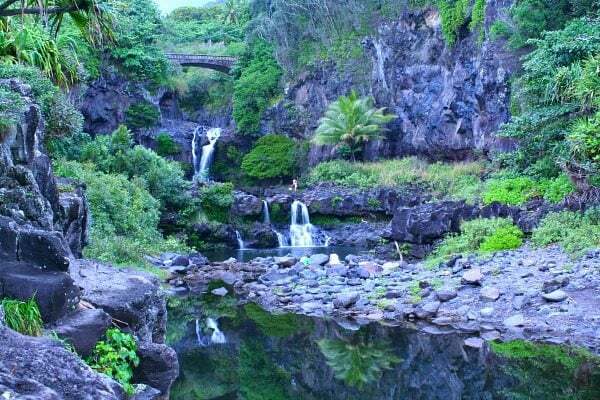 WHAT TO DO: Pools of Ohe’o (aka Seven Sacred Pools- beautiful waterfalls and pools… a popular attraction on Maui), Twin Falls (easy, stroller-friendly waterfall hike), Four Falls of Na’ili’ili (hike that involves some tricky climbing), Jaws Surf Break (good place to view huge waves, if they’re happening), Pu’a Ka’a Park (picnic spot with waterfalls). 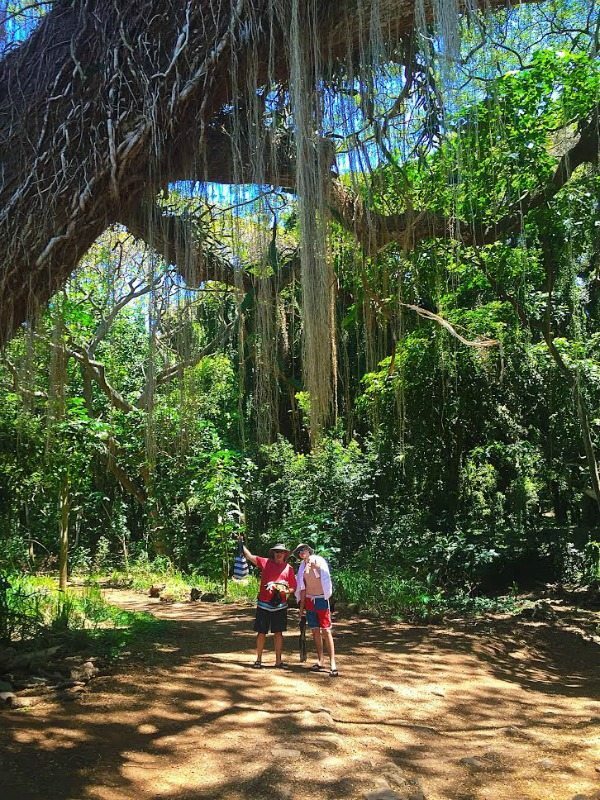 WHAT TO DO: Iao Valley Needle Hike (beautiful and peaceful), Maui Ocean Center (a bit pricey, but a favorite for kids), whale watching tours, Ziplining- Maui Zipline is great for families (you have to be between 50 and 250 pounds and can be as young as 5 years old, and they have side-by-side ziplines so you can go with another person). WHERE TO EAT: Star Noodle (recommended by EVERYONE), Lahaina Grill, Ono’s Tacos (taco truck, but parked in one place– for a quick bite), Leoda’s Kitchen and Pie Shop (super good pies & yummy sandwiches), Okazuya & Deli Honokowai (this is one of our favorites-the owner was the head chef at Mama’s Fish House & the food is all legit & well priced), Koa’s Seaside Grill for breakfast (try the gigantic fried rice plate and bring the leftovers home to have with dinner! ), Italian Delight (good place to grab a quick slice of pizza), 808 Grindz Cafe (best banana pancakes on the West side), Sea House (incredible breakfasts), Ululani’s, Pacific-O Maui on the Beach, Duke’s (we really enjoyed our dinner here with a fabulous view… and don’t skip out on the Hula Pie), Gazebo for breakfast (get there at 6am to stand in line but it’s soooo worth it for the best macadamia nut pancakes), Lahaina Pizza Company, Aloha Mixed Plate (my husband and I went here for lunch one day– nothing fancy– and we were super happy with our meals and cheap cocktails. 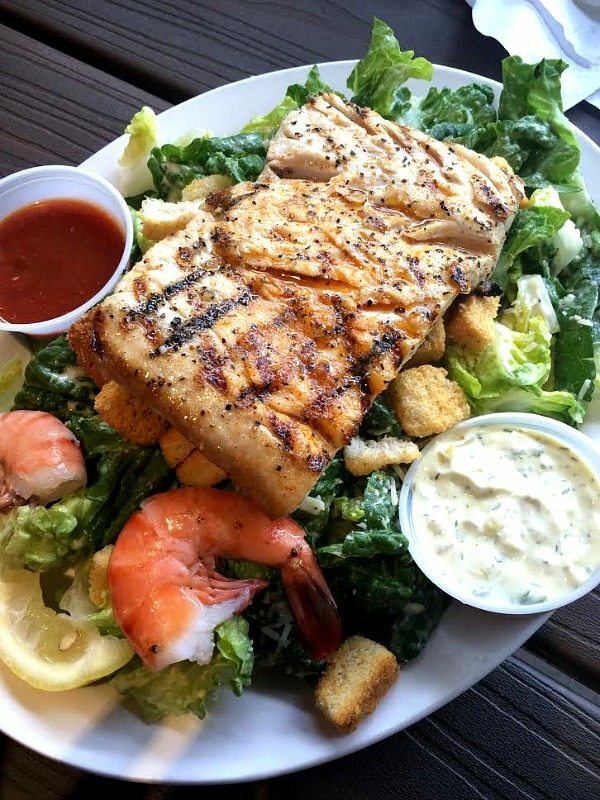 They have a good happy hour too), Merriman’s (Farm to Table), The Plantation House (nice atmosphere overlooking golf course), Hula Grill (we just thought this one was ok… but it has a nice location right on the Kaanapali Beach boardwalk). 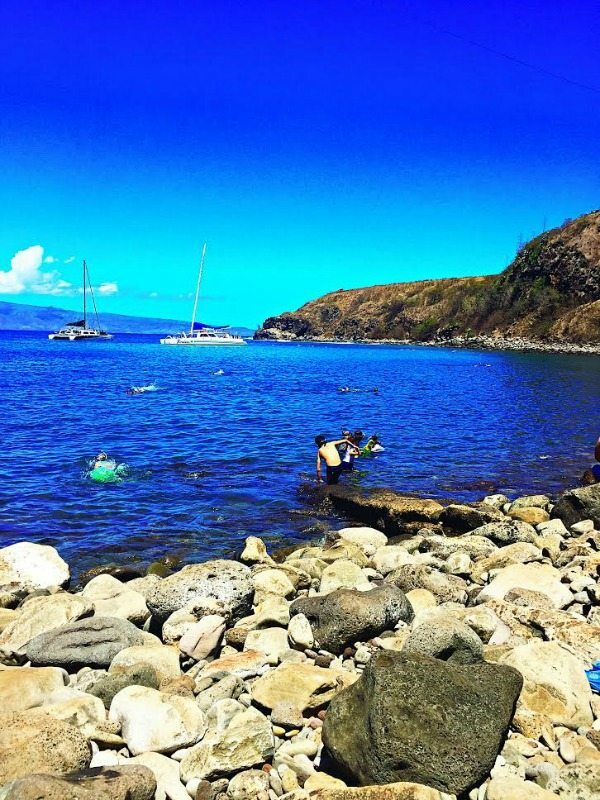 WHAT TO DO: Snorkel/catamaran tours to Molokini out of Lahaina (we have used Trilogy sails and loved them), Mile Marker 14 (great snorkeling for beginners), Launiupoko Beach Park (good spot for beginner surfers & a great little bay for the kids. Very popular with locals), Warren & Annabelle’s Magic (hilarious show but over 21 only- don’t do dinner there, just drinks), Burn’n Love (Elvis impersonation show- we really enjoyed this show in downtown Lahaina… the guy playing Elvis is fantastic. Kid friendly), Old Lahaina Luau (traditional luau and feast… if you want to experience that! ), ‘Ulalena (beautiful show about Hawaii), Front Street Lahaina (nice little shops for souvenirs & a good amount of history & food), Honokowai Park (great protected beach for kids with a little park and a deli across the street), Napili Bay (great beach), hike Olivine Pools, Nakalele Blow Hole, Honolua Bay (short jungle trail hike, great snorkeling among coral reefs but no sand, so not a good place for little kids), D.T. 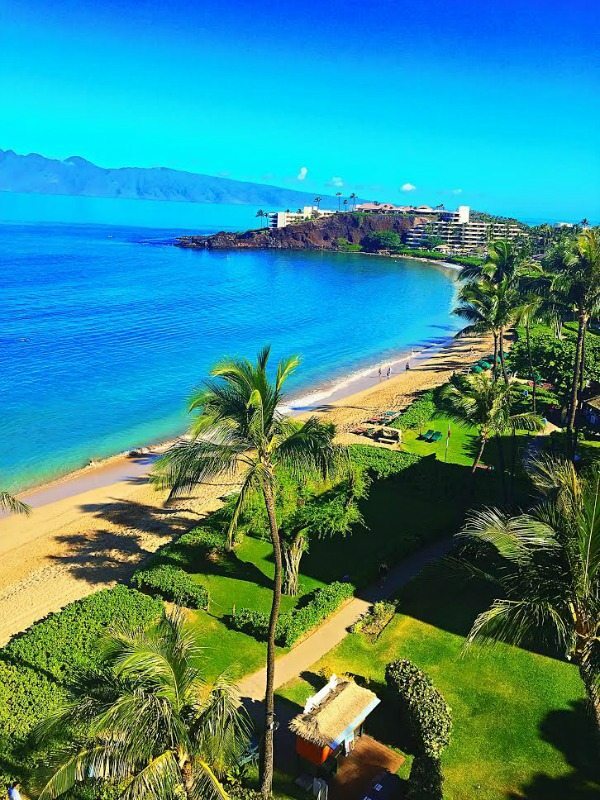 Flemming Beach (great body boarding), Kapalua Bay (great beach & kid friendly), Black Rock (great beach, good snorkeling, & cliff jumping), Cliff House (beautiful waters & awesome cliff jumping. No sand), and shopping at Whaler’s Village. Where we stayed: The Whaler on Kaanapali Beach (condo rentals): looking from balcony of condo out toward Black Rock. Disclosure: This was a trip I took with my family- it was not sponsored. The recommendations shared are from many friends and relatives who have visited Maui and our own experiences too. Enjoy your trip! I’ve never been to Hawaii, and definitely have it on my bucket list (top five!). 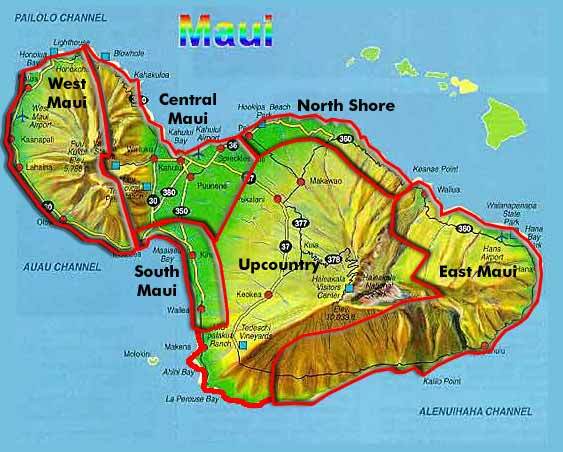 What a great resource for visiting Maui! We went to Maui many years ago, and I don’t even remember where we ate, but we loved the food! This is a great roundup of places to eat and hopefully I’ll be able to refer to it, soon! It’s definitely high time we go back! Now I want to go to Hawaii! 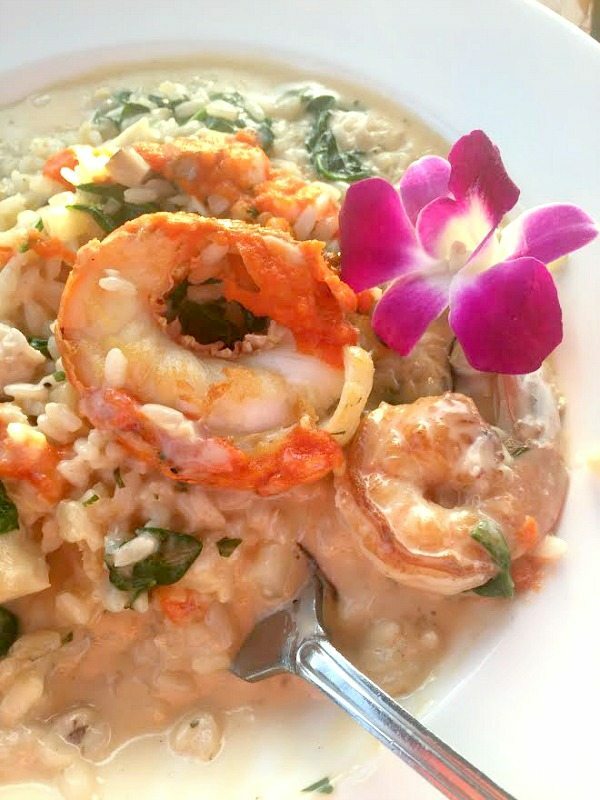 It looks like you had a great (and delicious) time!